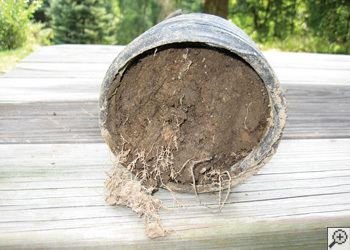 Here is a cross-section of a French drain system running along the cement footing of a foundation. 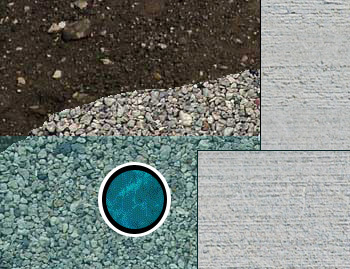 It shows the drain (blue with water), the crushed stone it rests in, and surrounding replacement soil. Other contractors commonly recommend a French drain system to keep a basement dry and it is installed around the outside of your foundation. Remove all obstacles around your home where the drain will be placed. 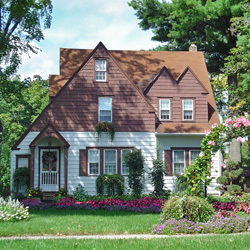 This includes all trees and shrubs, flower beds, stairs, patios, porches, etc. Dig down and remove all the soil from a trench that runs around the outer edge of your house. Lay down a layer of crushed stone, place the drain over that, cover with a cloth membrane to prevent soil clogs, and cover with another layer of stone. Fill the trench with the loose "backfill" soil that will eventually self-settle over time. Systèmes Sous-sol Québec does not recommend this method as a way to prevent water from entering your basement. A suggested system that is less costly and quicker is an interior basement drain that sits along the outer edge of the inside of your basement. To get your free waterproofing quote and have a drier basement in Quebec and surrounding areas, contact us now. ..and whatever else is in the way. All the soil removed will now sit in huge piles around your yard, waiting until the job is finished and it can be put back. Besides being costly, this also takes a longer amount of time to finish than an interior system and is completely dependent on the weather. 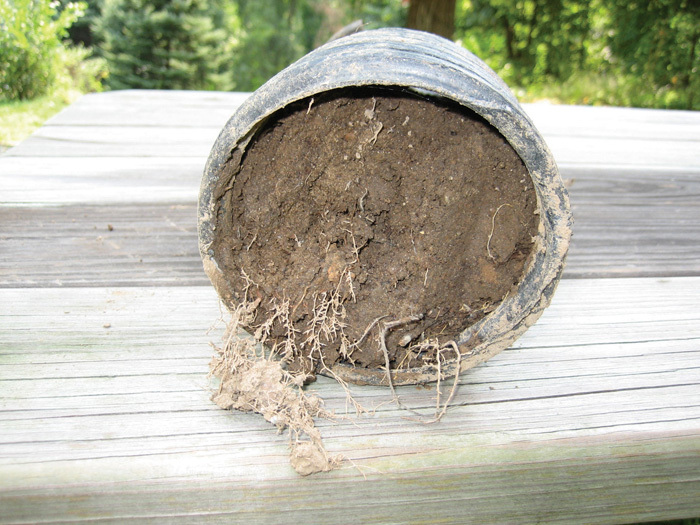 This is a section of a completely dirt-packed drain system from a house in Montreal, QC. French drain systems are a common and popular drainage system that have been installed since the early 1920s. Unfortunately that does not mean it's effective. Many times, the contractor wraps the drain in a permeable fabric or membrane to prevent the drain from clogging. We find that this is not a good solution, as the fabric and not the drain becomes clogged, preventing water from entering the pipe. Getting the pipes angled for proper drainage and pipes freezing during the winter are also important factors. Water may also pool up and collect under a basement floor. How does a system that runs above and outside that do its job? It doesn't, meaning a sump pump will have to be installed inside your basement to try and rectify this added problem. Finally, when this system clogs, how does it get fixed? The remedy is to dig it all back up and start the process all over again. To schedule your FREE basement waterproofing quote, contact us today! We offer our services to Quebec including Repentigny, Brossard, Kahnawake, Saint-eduoard-de-napierville, Saint-isidore-de-laprairie, Saint-mathieu-de-laprairie, Saint-michel, and surrounding areas.